First and foremost, thank you for your time and attention! We truly appreciate your prayers, love, and help in spreading awareness for all those affected by Polycystic Kidney Disease. Over the last several years, our small family has been through hell and back multiple times. On a chilly November day during a routine ultrasound, my wife, Jamie and I were dealt devastating news. It was presumed my 28 week pregnant wife was carrying our daughter who was suffering from a genetic condition known as Autosomal Recessive Polycystic Kidney Disease (ARPKD). This disease has and will forever impact our lives every day. The survival rate of children with this disease is extremely low and still today very little is known about the disease. Families dealing with this disease have on-going battles with doctor appointments, endless balancing of medications and diet, and all the effects of high blood pressure on the best side and on the opposite end have endless ER trips, hospitalizations, surgeries, on-going dialysis, and eventually transplant(s). Following that November morning, Jamie & I spent several mornings in various doctors’ offices and experienced every emotion from total heart wrench & anger to complete faith & peace. Our daughter Lillian Grace, against all odds, was born early the morning of January 15th, 2013. She spent 50 days in the NICU where she fought tirelessly. The first 2 weeks of her life, Jamie & I spent discussing the timetable for transplant. Lillian’s kidneys were growing at an alarming rate, and her tiny body just couldn’t accommodate them. Every single day was spent working sparingly, scrubbing hands continuously, celebrating one step forward, and despairing in two steps back. After what seemed an eternity, we were released and free to take our sweet girl home. We went home, but the struggle did not end. We came home with in-home nursing and a G-tube feeding tube & machine. Our sweet, beautiful, energetic girl flourished as soon as she got home. Within weeks, she was eating orally, her blood pressure was under control, and she was growing and thriving. Since then, the inevitability of a transplant still looms and haunts us. Lillian is now 5 years old and is as spirited and happy as ever. Unfortunately, the last 5 plus have not been a joyride. Lillian has on-going treatment which includes a cocktail of blood pressure medications, monthly labs & blood draws, regular dietary, nephrology, & cardiology appointments, multiple hospitals visits and overnights, as well as abdominal surgery. This disease has become an integral part of our life. Lillian Grace is a trooper who gladly takes her medicine and blood pressure multiple times per day. She constantly shows us how great she is. Unfortunately, the financial burden is continuous and building. As a result, Jamie & I created Hope for Lillian Grace. 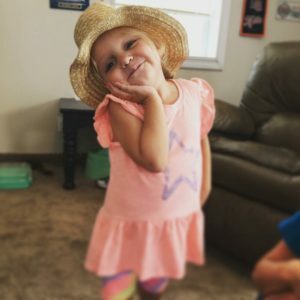 Your support for the Hope for Lillian Grace will go to Lillian’s on-going ARPKD treatment which will eventually lead to her receiving a kidney transplant by easing the financial burden and furthering PKD research through the PKD Foundation. From the bottom of our hearts, thank you & God bless!